The Darwin Sunday Markets at Mindil Beach provide a chance to play on the beach, watch the sunset and enjoy an evening meal watching local artists or browsing stalls full of interesting arts and crafts. These markets run from May through to October each year. Generally a little smaller than the Thursday Evening markets at Mindil, but a bit more relaxing and less crowded. Definitely easier to find a park for your car. A good view can be seen by following the walkway to the north, over a short boardwalk through some mangroves and up a small hill to the back of Darwin High School. Mindil Beach from the Darwin High School lookout with the Casino on the right and the city skyline in the background. 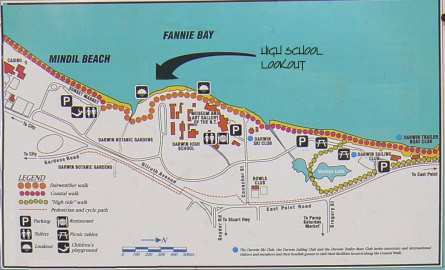 Continuing north along the walkway will take you to the Darwin Museum and Vesty's Beach with it's popular boat ramp and Ski Club. This section of the Beachwalk is named after artist Ian Fairweather who sailed a raft single handed from Darwin to Indonesia in 1952 with a wrist compass and a few tins of food. The markets stretch along the back of the beach, largely hidden by trees in this view. As you walk down the hill towards the markets, first you hear the sound of local musicians then the stalls come into view among the trees. 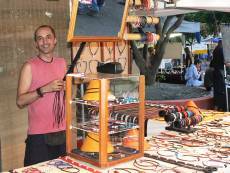 Jarek plaits kangaro leather belts for sale in his stall at the markets. Read more information on Local Arts and Crafts, including descriptions by the artists themslves. Return from Darwin Sunday Markets to Enjoy Darwin Home.